An update on Wednesday's rally in Sacramento: I am publishing this that I received from Jean Harrah at Deep Roots Ranch. It contains more information about the rally on Wednesday at our state capitol, in support of raw milk. Assembly Woman Nicole Parra announces Ag Committee hearings on AB 1735 raw milk issue. You must attend! Raw milk needs every one of you! Congratulations to all of our customers and supporters! Your hard work writing letters and making calls has paid off! 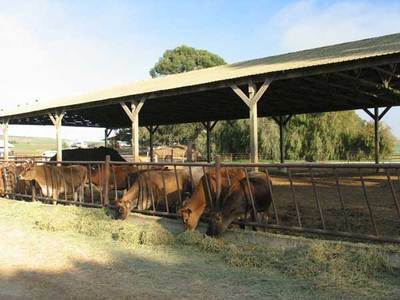 NOW IS THE OPPORTUNITY OF YOUR LIFETIME TO PROTECT RAW MILK IN CALIFORNIA. There is a meeting by the Assembly Agriculture Committee on Wednesday, January 16th. The Committee is currently scheduled to hear three bills. Pending approval by the State Assembly on Monday, a fourth bill will be added to this list. This bill will propose technical corrections to AB1735, which took effect on January 1st. If these corrections become law, our raw milk will continue to be available. IT IS ABSOLUTELY CRITICAL THAT YOU BE THERE! We need the impact of a multitude upon these legislators, who will be hearing our side of the story for the first time. 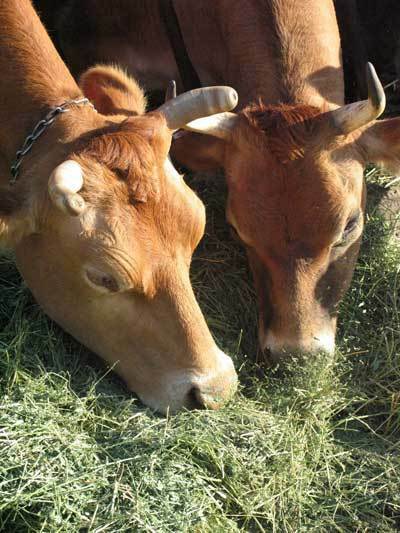 This is the most important thing you will do to insure your supply of raw milk for the future. Do whatever is necessary to be there. Take off work, school, reschedule appointments, make it a field trip for your kids. You will be making history. Otherwise, raw milk may be history. NOTE: For security reasons, do not bring anything you would not bring on an airplane. We will provide banners and signs for you. Satisfaction in mobilizing with the California "living foods" community! PLEASE RSVP at customerservice@organicpastures.com if you plan to attend. REMEMBER TO CALL EACH ASSEMBLY MEMBER PRIOR TO THE HEARING. Go to http://www.organicpastures.com/ag-assembly-info.htm for contact info and message points. If you are interested in carpooling from the Santa Cruz area, please contact me [tanabutler at gmail.com] and I will pass your name along to a group who's going. 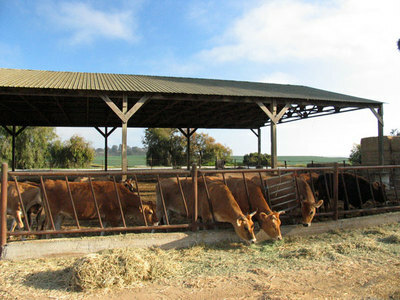 Pictured here: one of the sweet Jersey cows at Claravale Farm, one of California's two raw milk dairies. "Raw milk has coliforms. That is simply its nature. That is why it sours in my refrigerator. The beneficial strains of coliforms, the other beneficial bacteria, and the immunoglobulins are why I pay more for raw milk. "I know that folks at the statehouse think I’m crazy and uninformed. They visit dairies regularly and know that it is increasingly common to find E. coli 0157:H7 in their cows. I am playing “Russian roulette,” they claim. "But there is something that humans and cows have in common. When we are living on a diet that God intended for us, our intestines are less likely to be a breeding ground for pathogenic bacteria. When our gut is full of beneficial bacteria, it can fight back when we come into contact with pathogenic bacteria." There is also David Gumpert's piece at TheCompletePatient.com: "The reality, though, is that it is difficult to educate people about the true nature of coliform bacteria at varying levels. It’s also difficult to change legislation immediately after it's been passed. It’s especially difficult if the legislation was put into effect to accomplish a very serious long-term goal—namely, to deprive as many Americans as possible of the opportunity to obtain raw milk." I have little more to add to the outcry beyond what I have already said here, but would like to direct your attention to something VERY IMPORTANT: Bonnie Powell, aka "Dairy Queen" at The Ethicurean, and deputy editor of Edible San Francisco, got a call from Collette Cassidy at Claravale Farm (one of the only raw dairies in California), alerting everyone to attend a rally on Wednesday in Sacramento. Assemblywoman Nicole Parra will hold a hearing on AB 1735, and your attendance could make a difference. Read Bonnie's talking points, please. And if you can carpool and get to Sacramento, you might be part of making history. 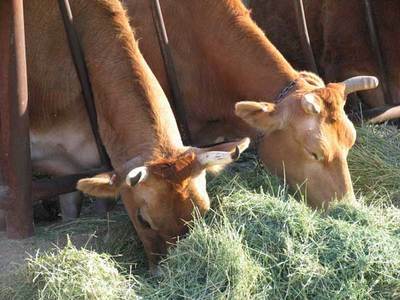 Failure to overturn this bill will effectively kill raw milk in California. Please go to the link above and read what they have to say. I am really really really busy with work, and the weather's been horrid...but it's getting better and I hope to get out to a real farm real soon. Thanks for visiting. Go rattle some bars in a government office: it'll feel good. This picture was taken on October 18, 2003, at Coleman Family Farm in Carpinteria, California. 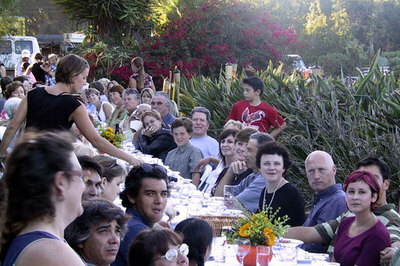 In the lower left corner, you can see the beaming face of Evan Kleiman, who with her small and dedicated crew from Angeli Caffe in Los Angeles, had just prepared the most delightful al fresco dinner for the crowd you see. Across the table, peeking out from the profile of the man in the blue shirt—and unbeknownst to me at the time—is Tracey Ryder, publisher of what was then a small quarterly local newsletter known as Edible Ojai. Little did I know that six months later, in one of a steady stream of e-mails pertaining to food and farms and beauty like the kind you see here, one of my oldest (as in "long-lived friendships") friends in the world, Maria Nation, would send an e-mail about Edible Ojai and her friends, who published it. 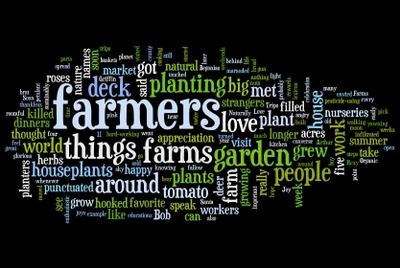 food/farms/ideas etc. Very cool and might give you some ideas on putting Santa Cruz on the map. Well, of course I was gobsmacked when I saw Carole's photographs, and double gobsmacked to find out that Tracey had attended the dinner I was photographing at the recommendation of a mutual friend of hers and Maria's. One Answer to Flawed Thinking: "California's Real Water War"
Pictured here: a recent visit to one of Santa Cruz's best places to eat and mingle: Soif Wine Bar & Merchants. I was recently hired to do some photography for their new website—they're in the process of selecting photos now. 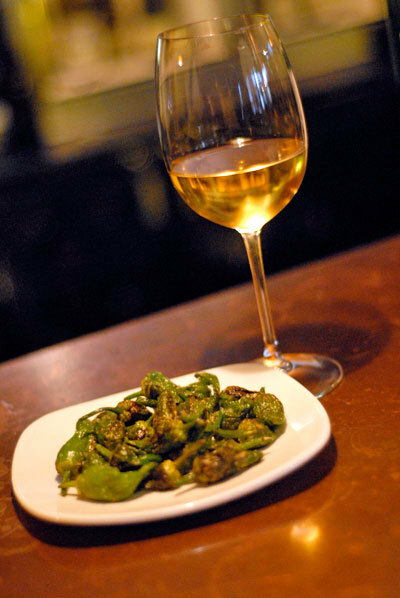 The wine is a dry moscato, Oppidum, from Italy, and the padrón peppers are from Meder Street Farm, up near UCSC. I will write more about them another time: it is a wonderful place to go. This is going to be brief, but Bob handed me the newspaper yesterday, and it contains an answer to the flawed thinking of Mr. Fred Freid (and allegedly, his professors). Mr. Freid wrote: Our professors in the subjects of Botany and Agriculture have both stated that there is no scientific basis for Organic foods to be healthier than Conventionally grown foods. I took a course on Botany, and will say now that nutrient density is not based on the amount of pesticide sprayed. The words straight from my professors mouth: "The Organic craze is nothing but un-researched, hippy-spread bull****." "In 2004 alone, tens of thousands of Central Valley residents received bright orange notices from their public drinking water systems saying their water was not safe to drink and exceeded legal contaminant levels. Many Central Valley residents drive 30 to 50 miles each week just to buy bottled water, effectively doubling the price for this basic need. "More than 90 percent of Central Valley communities depend on water stored underground for their drinking water. Unfortunately, years of intensive farming with uncontrolled chemical use has heavily poisoned that source. Recent groundwater sampling in Tulare County found that 3 out of 4 homes with private wells have contaminated water that is unsafe to drink." Paging CASFS, Paging CASFS: Come In, Do You Read Me? The man pictured here is well known to a great many of my friends, and I am reluctant to name him, as he doesn't seem to seek the limelight. I think he'd rather you look at the things he grows than at him, and I understand that. 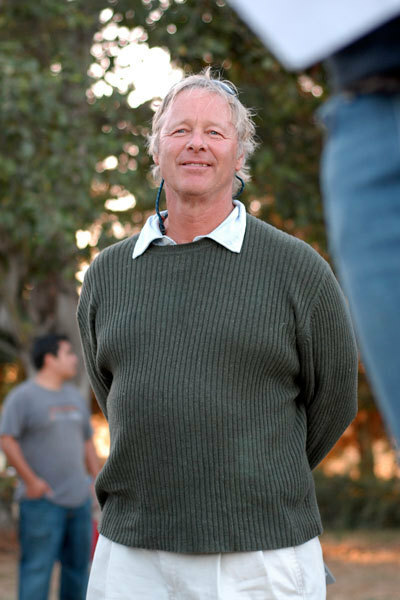 But because of his 30-year dedication to teaching hundreds and hundreds of people how to farm sustainably up on the UCSC farm, I immediately thought of Orin Martin when I received the following series of communications from one Fred Freid in Missouri. I would like to be respectful of Mr. Freid, but my golly, I'm having to bite my tongue right now. I am just going to post Fred's comments to a separate page, and beg Orin and anyone involved in sustainable farming—people who give their very lives to DO THE RIGHT THING—to address Fred's beliefs. I feel so deeply that the farmers I know are the true heroes on this planet, because they do REAL work—backbreaking work, sweating work, dawn-to-dark (not dusk) work—and nobody I know is gettin' rich from it. 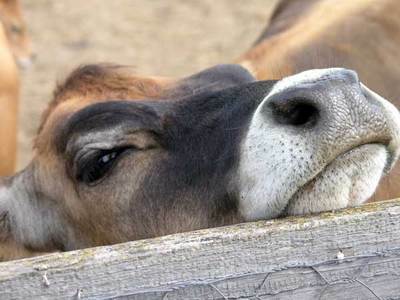 It's been a while since I visited Claravale Farm—Ron Garthwaite and Collette Cassidy have been under siege in legal woes that you, dear reader, can help with. I've written before about the how the Santa Cruz county bureaucracy threw up hurdle after ridiculous hurdle when Ron and Collette's landlords unexpectedly set about evicting from their Watsonville site. This week, I heard from Ron and Collette, who sent out the following e-mail. 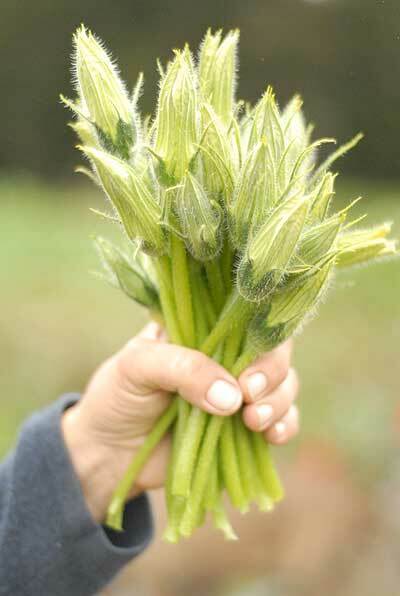 Pictured here: beautiful squash blossoms, held by Lori Fiorovich of Crystal Bay Farm. On Monday morning this week, I got a phone call from a farmer friend, Jeff Fiorovich, who runs Crystal Bay Farm with his wife, Lori. He asked for my help, and he's getting it. Jeff is about as down to earth as anyone alive: his trade is building, but he farms out of love for the land. Originally, Jeff's mother leased the small farm to conventional growers (if, by "convention," you mean "the tradition of poisoning the earth and its inhabitants with toxins unnecessary for the health of the produce or the consumers"). Jeff began to reconsider this arrangement, and eventually, took over the land to grow organically. Specialities include culinary squashes and pumpkins (which turn into a wonderful pumpkin patch at Halloween), as well as giant strawberries, some of which are dipped in organic chocolate and sold at their roadside farm stand.